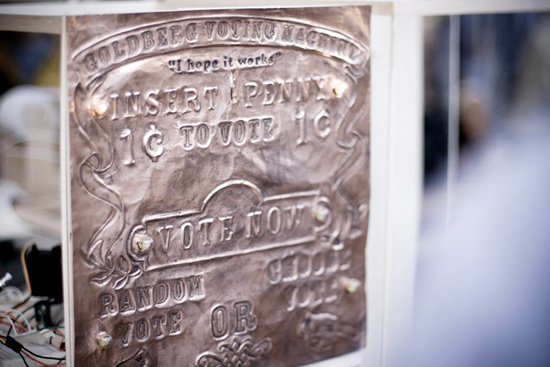 The Goldbergian Voting Machine was an experiment in democracy carried out by a group of nineteen students at the UCLA Department of Design | Media Arts in the Spring of 2008. The students worked together for 8 weeks to produce a fully functional voting machine comprised of nineteen individual modules. The modules communicated with one another through either physical or electrical signals which carried a vote through all nineteen modules until its final destination where it was archived.